PI Cormoran Strike and Robin Ellacott share a moment right after her vows to Matthew, coloring their detective partnership. A disturbed young man caroms into Strike’s office to exclaim about a child murder committed decades ago. Being hired by a politician to spy on a colleague distracts them, but the possibility weighs on Cormoran’s mind, as Robin goes undercover in Parliament. The non-case of the wild story becomes entangled within the political investigation and a dubious suicide. Meanwhile, Robin’s husband shows his true colors, but her desire to be independent only prolongs the sexual tension between partners. 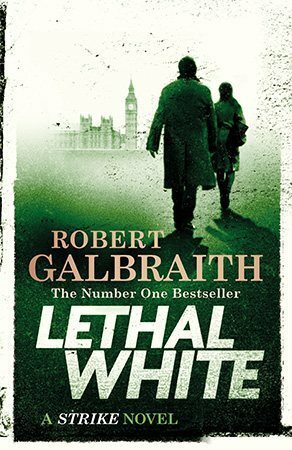 Galbraith keeps a fast, at times frenetic, pace throughout the story, with the main characters exasperatingly and credibly human in their complexity. It’s fun to see inside the heads of the good guys when they have fleeting thoughts that are unrealistic / unreasonable, such as when Robin finds herself drawn in by the charm of their client’s tall, dark, and handsome “bad boy” son, a person of interest. Fourth in the Cormoran Strike series, it’s easily a standalone for the case story, but adds layers of nuance to the partnership. The inevitable transition in the nature of the relationship will change the dynamics and sadly may be the beginning of the end, unless Galbraith finds a way to pull it off. Let’s hope she…whoops, “he” can do so! I received a copy of this latest release in the series from St. Martin’s Press for an honest review.